As much as Game of Thrones is an annual television event, the ninth episode of each season is an event in and of itself. The sometimes self-contained hours have offered audiences immense set pieces like 'Blackwater' and 'The Watchers on the Wall,' but they've also brought about the Red Wedding in 'The Rains of Castamere' and Dany's flight from Meereen in 'The Dance of Dragons.' Needless to say, the penultimate episode of each season raises the stakes of what's to come and often affords some greater indication of just how important everything that came before actually had been. Basically, these episodes serve to raise the stakes of the series as a whole, while offering some sense of payoff or (sadly) conclusion to certain threads that helps demonstrate the manner in which the series successfully subverts classic conventions of the fantasy genre. As things come down to the 'Battle of the Bastards,' then, the stakes have never been this high before. On one hand, Game of Thrones is faced with the prospect of allowing a genre convention to play out in a manner befitting the needs of the narrative. That is: Jon and Sansa and their patchwork army must do battle with the Ramsay Bolton and his superior forces on his turf. It's a classic underdog story, one that George R.R. Martin has flirted with in the past, most notably by putting Oberyn Martell in that position – a David and Goliath-like situation, if you will – in which the hero had victory well within his grasp, only to fall into the much more powerful grasp of the Mountain following a bit of ill-advised grandstanding. It was a brutal moment that makes the showdown between Jon and Ramsay less something to celebrate and more something to fret over for an hour. But let's go back to just how high the stakes are at this point. The North has taken an increasingly important role in the series, one that suggests the bureaucratic tumult of the game of thrones in King's Landing is (and really has always been) secondary to the threat lurking on the other side of the Wall, and the outcome of this clash will almost certainly determine whether or not Westeros – and the rest of the world – will survive the coming winter. But there's more to it than that; the fight for the North is also a personal one, as Ramsay's increasingly one-note and psychotic transgressions have made him Game of Thrones enemy number one with a flaming arrow. The character is well past his dead-by date and the threat of him emerging victorious after all that he's done makes the outcome of the episode's battle feel not only epic but also intimate. It's the kind of emotional manipulation Game of Thrones excels at, and the distinct possibility that the hour won't go the way the audience wants (and maybe needs it to) helps make the events feel weightier than the familiar scene of a cinematic battle between two massive armies normally would. And in true Game of Thrones fashion, there was some emotional manipulation going on, as all the teasing of the epic "Jon vs. Ramsay for the fate of the North" was delayed briefly so that Daenerys, her dragons, and the Dothraki could make quick work of the Masters and their attempt to assert dominance over Meereen while the queen was away. But make no mistake, Dany vs. the Masters isn't some undercard bout on the same bill as the Bastards' Brawl; it is the conclusion to Dany's overlong stay in Meereen and an example of what kind of force she is to be reckoned with as she prepares to move west. It makes sense that 'Battle of the Bastards' would open up with Dany and Tyrion discussing all that had transpired since she last set foot in the pyramid. For one thing, the huge set piece admittedly got the blood pumping before things potentially turned south on the audience. The scene was thrilling to the degree that those who've been wounded by the show more than once might have seen the ease with which Dany took back Meereen as psychological warfare, a warning that things in the North wouldn't go as smoothly. But it primarily served to pay off Dany's cameo appearance last week when Tyrion learned making deals with the Masters is a bad idea. Or, in other words: he drinks, and like a certain guy up north, he knows nothing. More than giving the viewers something to cheer about or have cause for concern over the fate of Jon, Sansa, Tormund, and poor, poor Rickon, though, the opening sequence revealed something interesting about Dany's plan and how her reflexive absolutism won out over Tyrion's old-school pragmatism and deal-making with the Her Majesty's enemies. Earlier this season, Grey Worm and Missandei warned Tyrion that the Masters were not to be trusted; they would find any reason to go back on their word and try to return the world to the one they recognized and profited from. In a sense, that's what Tyrion tried to do as well. Without Dany there to "break the wheel," those in power – or those seeking power – sought to make the wheel go backwards, to bring about something that has already been, to reinstitute an established and familiar power structure, one where familiar archetypes make decisions about which one of them will rule. That makes Yara and Theon's sudden appearance in front of Dany and Tyrion more important than their navy sailing in to save the day. Dany doesn't need saving, but she does need ships. More importantly, Dany needs someone who can see the value in overturning and destroying established power structures in order to make way for something new. Who better than another capable woman eager to lead and willing to do away with tradition for the sake of tradition? After all, Yara's uncle usurped her throne with little more reason than he's a man and tradition says men rule the Iron Islands. So why wouldn't Yara want to bring about change to a set of customs that favor a crazy man who's been gone for years over a woman who has earned her right to rule? In the end, Dany and Yara have the makings of a great Game of Thrones power couple. Meanwhile, the action in the North did unfold quite differently than events down in Meereen. At the end of the day, the Stark banners flew over Winterfell once more; victory went to Jon and Sansa and the Wildlings and even Littlefinger. Ramsay was beaten (literally beaten) and fed to his dogs, affording Sansa a much-deserved smile over his bloody fate. But while characters who has suffered for so long finally saw triumph – as so many have this season – it came at a much higher cost. 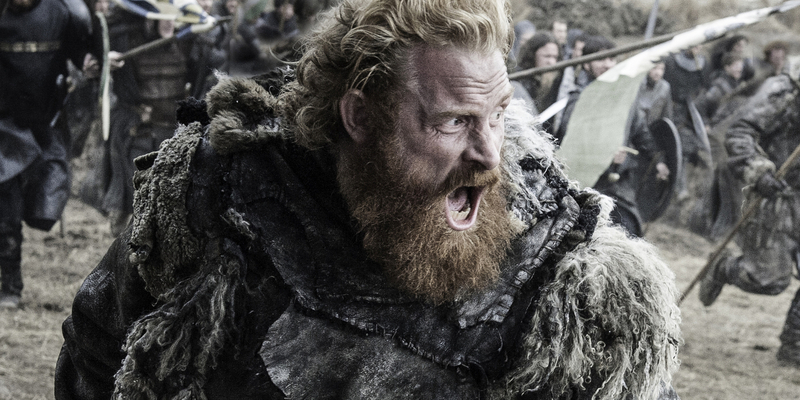 For those who feel as though the stakes in Game of Thrones aren't high enough now that the series is drawing closer to its endgame, they need look no further than Rickon's death mere inches away from his brother's outstretched hand or the massive casualties suffered by the Wildlings (Wun Wun, especially) as Ramsay's superior forces threatened to squash Jon's army after they put in an heroic effort. This was the death the series had been building towards, as Ramsay had always been a thorn in the show's side since he first began torturing Theon all those seasons ago. The character never developed much beyond his initial introduction; instead, his list of victims simply grew longer and longer. By the time he was turned into Kal Kan, Ramsay's satisfying demise was long overdue and came with the same sense of relief as the realization that Dany may soon be leaving Meereen. But the episode managed to satisfy in more ways than presenting situations in which the "good guys" won. The battles were beautifully staged and filmed by director Miguel Sapochnik, showing just how much the series has grown from the spectacle of something like, say, 'Blackwater' to an episode like this. It was pleasurable in a way that's foreign to Game of Thrones. So far, this season has delved into rebirth and resurrection, but also victory for those who have never tasted it. As the series seems to be burning through the last bits of its storyline in rapid fashion, it might be advisable to enjoy these victories while they last. After all, winter is still coming.